It is quite simple to find Poi Kalyan complex - its leading construction, Kalyan minaret, towers above the city of nearly 50 meters and is visible from almost every place of the city. Moreover, according to some sources, at one time it served as a beacon for the caravans coming across the desert surrounding Bukhara. Taking into account the fact that the city did not change its location, and only expanded the borders, Poi Kalyan complex, located in the center, even after thousand years still remains, in some sense, the axis of Bukhara. Construction of first buildings of the complex began in 713 year, together with the arrival of Arabs, and the beginning of imposing the Islam. During this time, the complex was many times destroyed and re-constructed, and only the minaret built in 1127 could stand all tests of time: earthquakes, fires and the destruction of the city by the horde of Genghis Khan. The height of this giant is 46.5 meters, and the foundation goes 10 meters into the ground. At the base, the diameter amounts to 9 meters, and on top it is of 6 meters. Inside the tower there is the spiral staircase of 104 steps, effaced under the feet of thousands of people. By the way, some people just went upstairs, and wee dropped down from the platform on top. This form of penalty was applied to criminals in this city until the end of the XIX century. 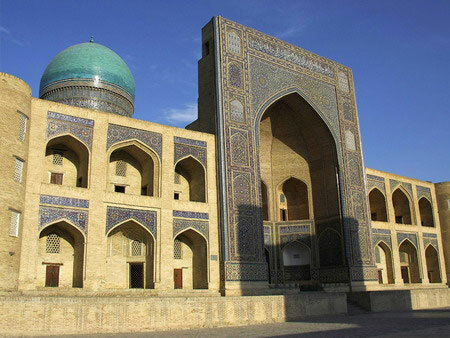 Close to the minaret there is the mosque Kalyan, the building of the early XVI century, which by its scale is compared with the famous mosque of Bibi Khanum in Samarkand. This mosque also has a spacious courtyard, surrounded on the perimeter by khujdras (cells). In the far end of the courtyard there is the portal of the main hall of the mosque, behind which the massive dome on the mosaic cylinder rises, covered with blue glaze. All other parts of the mosque are the gallery, which is held by 208 columns that serve as bearers for 288 domes, of this majestic building. The third and final building in the Poi-Kalyan complex is the Madrasa of Mir-i Arab, which even today is used for its intended purpose - classes on religion, politics in relation to the Islamic world are held here. Built in 1536, it was used not only as the educational institution, but as a tomb - Ubaidulla Khan, who invested in the construction of madrassah, and Mir Arab, the architect of this ancient building, are buried here.